She began her impersonation career in the fall of 1995 when she first appeared as an actress in local murder mystery dinner theater productions.She auditioned for the part of a Reba McEntire look-alike. Unsure as to whether there was any similarity between the “Queen of Country Music” and herself, she went searching for photos of the country music legend.To her amazement, the similarities were uncanny. The show ran for three months and received rave reviews.Following the closing of the show, She decided to continue her venture into the arts, combining her love of music with the sheer fun of impersonating the most-beloved female country singer of all time, Reba McEntire.She studied hundreds of hours of music video clips and continued to perfect her singing voice until she was ready to take her show on the road.She has won several local and national lookalike contests. Country Weekly magazine’s grand prize celebrity contest winner,she received an all expense trip for two to Nashville where she was featured twice in their magazine, autographed at Fan Fair 2000, was part of the TNN Awards show hosted by Jeff Foxworthy. Her picture also appeared in Country Live magazine.December 2001, she was selected to be one of eight contestants on The Weakest Link hosted by Anne Robinson where she was able to raise $10,000 for charity.November 2002, she was once again selected to be a character contestant on Hollywood Squares. She has fooled not only die-hard Reba fans, but Reba’s band, staff and peers as well; including Tim McGraw, Ronnie Dunn, Toby Keith, JoDee Messina, Terri Clark, Linda Davis, Pam Tillis and many more. 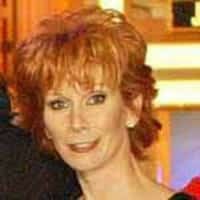 Reba’s son, Shelby, said, “that woman looks just like my Mom”, when he spotted her in the audience at a taping of the Reba sitcom, while Al Roker had security pull her from the audience of The Today Show telling Reba they should do a “Patti Duke, country style” show.For fans who can no longer see a Reba performance, this is clearly the next best thing! Her tribute show covers various material from Reba’s early career through her most recent work, and has performed for thousands of fans all over the country. Audiences continue to be amazed at the sound-alike and look-alike qualities she possesses. And as long as there are Reba fans, she will continue to entertain crowds with her warm, friendly, and “perky” personality unique to both Reba and herself.